A few clouds from time to time. Low 56F. Winds S at 5 to 10 mph. Morrissey apparently was losing his voice six songs into his Fox Tucson Theatre show and left the stage without word. No one made any announcements when Morrissey left the stage Monday night and didn't return. Some fans thought the show was just delayed until the crew started breaking down the stage. 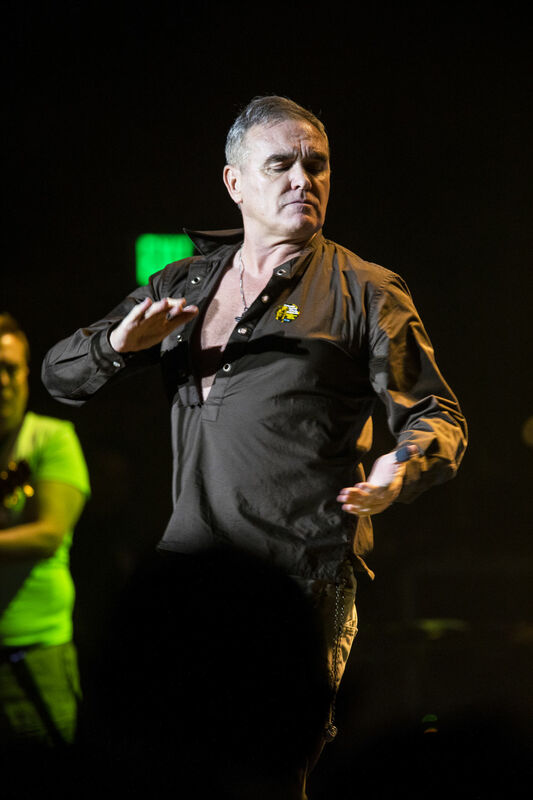 Morrissey apparently lost his voice 30 minutes into his Fox Tucson Theatre show Monday night. Without a word to the sold-out audience, he left the stage and the house lights came on. Fox Tucson Theatre officials announced Thursday that refunds would be given for Morrissey's abrupt Monday show. Morrissey's show Monday night at Fox Tucson Theatre was sold out. Six songs into his sold-out Fox Tucson Theatre Show Monday night, English rocker Morrissey slipped off stage and never returned. According to a dozen or more social media postings — many of them from outraged fans who had paid $60 to $100 for a chance to see the iconic Smiths frontman — Morrissey was 30 minutes into his show when it ended after he sang "Everyday is Like Sunday." "He sang for 30 minutes, said he was losing his voice & then walked off of the stage." Tucson photographer Cynthia Elliott said on Facebook. "House lights went up. The show was over." Fox Tucson Theatre Executive Director Craig Sumberg on Tuesday said they were negotiating with managers for Morrissey, 57, about possibly rescheduling the concert or giving refunds. There apparently was an agreement between the promoters and Morrissey's management that Monday's concert was not a "formal show," which could open the door for some sort of remedy, he said. "The best for all concerned would be to reschedule the show," he said. Sumberg said he hoped to know more later Tuesday. In an email sent Tuesday afternoon to patrons, Sumberg apologized for the “abrupt termination of last night’s Morrissey show." In a video from the concert posted by Madchester.com, Morrissey told the audience "it seems I have left half my mouth in Guadalajara." "But I will stand here and I will sing and if necessary, I will drop dead," he said, according to the video clip. Sumberg said a Morrissey band member told the audience from the stage that the singer could not finish the show. Morrissey's spokesman Gustavo Manzur posted on Facebook that the singer's voice was "reduced to a whisper." "My heart is broken but if this is the worst, thank the Lord. We'll take care of him," Manzur wrote. "He tried ... he would have NEVER come out if didn't think he could have. He tried. His voice is gone. But he's not. Just a bit of rest for his voice. Please understand. He is human." Not long after Morrissey exited stage right, Tucsonan Steven Yanez Romo tweeted, 'Sometimes, you think Morrissey can't out Morrissey himself. Then he Morrissey's harder than ever before. Joke's on us." One die-hard Tucson fan, though, said she appreciated the six songs and thanked Fox for holding the concert. "I long awaited for his presence and so much of my soul and spirit went into this night," Julie Riza, who goes by @morrisseygirl on Instagram, said in an email. "It was lovely. It was beautiful. Six songs, beautiful songs. It was intimate, it truly was a blessing. Almost perfect." Madchester.com said Morrissey sang "Suedehead," "Alma Matters," "When Last I Spoke To Carol," "Speedway," "Staircase At The University" and his final song "Everyday is Like Sunday." Morrissey is set to play a sold-out show at the Tobin Center for the Performing Arts on Wednesday, April 12. A box office spokesman on Tuesday morning said that show is still on. Singer left the stage after six songs Monday night after losing his voice. Readers chimed in on this new list of restaurants that have been around for decades.